You may have seen data or applications which tell you what time of day that you should post Twitter status updates for maximal effect because people are more likely to see and share your Tweets. I’ve always wondered whether to follow this advice, because I had a feeling each user’s Twitter community is ‘tuned’ to the times in which they Tweet and also dependent on factors such as time zone, etc. Here is a brief analysis of the time of day I tweet as Comprendia and the replies I receive, along with recommendations based on the analysis and general guidelines for using timing to improve Twitter engagement and exposure. We used our own Twitter analysis software and data to determine the time of day (in US Pacific Time) status updates were posted during a 6 month period (January 14-July 14 2012) and the data are graphed in the figure in this post. 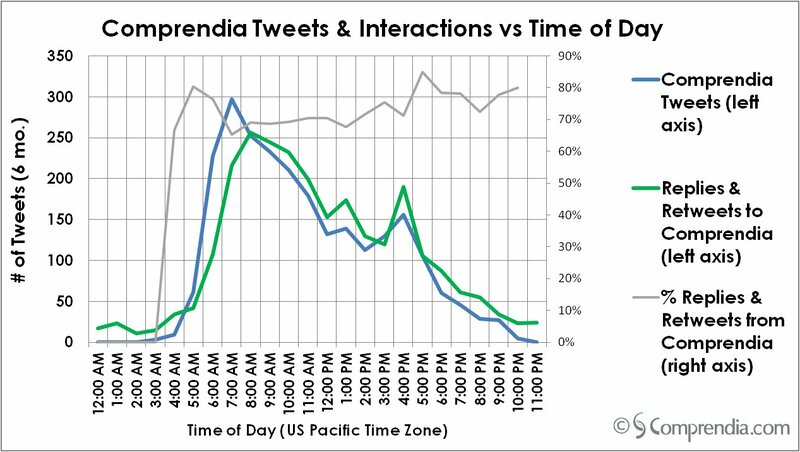 On average, the maximum number of hourly Tweets from the Comprendia account (blue line) occurs between 7-8 a.m., with another peak between 4-5 p.m. For the replies to Comprendia, we tracked all tweets containing “@Comprendia,” including retweets and replies. Perhaps not surprisingly, the peaks in the replies to Comprendia (green line) occur an hour after our morning peak, from 8-9 a.m., and coinciding with our afternoon maximum from 4-5 p.m. The two curves look remarkably similar in shape, with the replies to Comprendia (green line) peaks being slightly more spread out than the Comprendia curve (blue line). Presumably this is because there is a ‘reaction time’ to our tweets from people in different time zones. Additionally, you can see that while the Comprendia curves bottom out, the others don’t ever go to zero (I don’t often schedule tweets and have to sleep sometime!). It is also quite interesting to see that while the number of replies is less than the number of Comprendia Tweets in our a.m. peak, this is reversed in our p.m. peak—perhaps our followers are more attentive during this time? It is intriguing that the number of replies and retweets we received during this six month period, 2555, is almost equal to the number of Comprendia Tweets, 2417. Surely this number also depends upon factors such the number of @Comprendia followers and how much we engage on Twitter. We calculated our engagement ratio and on average during ‘Tweeting hours’ 73% of Comprendia Tweets are replies or retweets. We also looked at the percentage per hour (grey line), and see a peak between 5 and 6 a.m. (just waking up, many retweets and replies to overnight comments) and at 6 p.m. (perhaps in response to the replies received). Overall, however, this ratio does not vary significantly throughout the day. Tweet ‘important’ items (e.g., blog posts) 3 times: once at each of the two peak engagement times (8 a.m. and 4 p.m.) and once during a time I don’t normally tweet (e.g., 3 a.m. PT). Continue to interact live on Twitter, but schedule some non-time sensitive items so that they are spaced throughout the day using an application such as HootSuite. I don’t do this currently for simple reasons–my favorite Twitter app Twhirl doesn’t allow for scheduling. Also, the ‘new’ retweeting, which I prefer to use, doesn’t allow for scheduling, even on HootSuite. Perhaps my application preferences will change as a result of this analysis. How can you benefit from this information? Contact us if you’d like us to do a similar analysis on your account. Additionally, you should realize the potential for gaining exposure by interacting with other Twitterers—we are reaching many more than just our followers through Twitter replies and retweets which equal the number of Comprendia Tweets. In addition to automating some posts for maximum exposure, your Twitter strategy should include logging into the application and interacting with other Twitterers, something we don’t see with many life science companies (check out our Twitter list to see for yourself). You may not have a detailed time of day map such as the one presented here, but you can see here that engagement begets engagement, leading to myriad benefits.